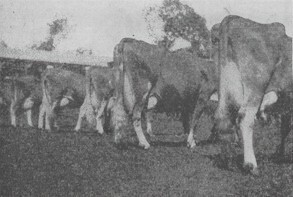 A few superior Guernsey bulls and their breeders. 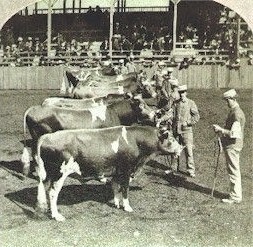 The yearling Guernsey bulls shown at the fair. The judge of the Guernsey show was Prof. T. L. Haecker from the Minnesota Experiment Station, St. Anthony. After two days of judging, an exhibitor lodged a protest against Professor Haecker because some of his decisions didn’t agree with the opinions of a few experienced breeders and he didn’t completely go by the official scale of points. A consulting judge, P.H. 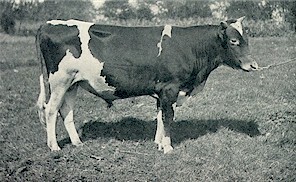 McCormick, an experienced Guernsey Breeder, was chosen to assist, beginning with the aged cows. 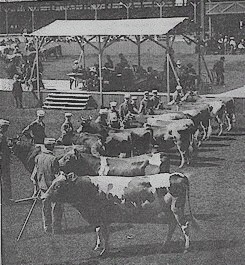 The Guernsey cows shown at the fair. References: Breeders Gazette. September 28, 1904; World’s Fair Bulletin. November, 1904. Photos from Irwin Collection and Breeders Gazette. This page was designed by Chad Lilienkamp and is maintained by Lyndon Irwin.